I just love how this card turned out! And I don't think I've ever had a card come together so easily. I wanted an image that was "cute," that when you see it, it makes you smile. I think this sweet owl fills the bill. She's from Twinkle Toes cartridge and I cut her at 3-1/4". The card is A2 size. The white mat is embossed with a new Cuttlebug folder called Charles. Her eyes are from the PK Critter Face set. And the pearls are Recollections brads I just bought at Michael's. I bought all the purple paper there, too -- 6 for $1.00. The sentiment is from MCT All Around Birthday Time, which is stamped on a punched circle, layered onto a scalloped circle (EK). Follow the challenge by using purple and pearls in your card, layout or altered project. 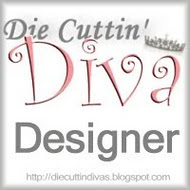 Remember that you must also use a die-cut and link your post back to the DCD blog. Thanks so much for stopping by! I appreciate your visits. Hoot! Hoot! This is super cute! Loving the purple brads too. Too, Too Cute!! Love it!! Oh my goodness,this could not be any cuter! I love the fun purple and your owl, simply adorable! This card is so super cute! Love the cute owl! Have a great day. OMG how cute is this owl! Love your purple and pearls project.